The 2011 Jewelry Collection has been posted in the Amigami Gallery! All of the pieces feature natural semi-precious stones and are designed with the warm upcoming days of Spring in mind. And of course, many of these pieces are currently available in my Etsy shop! These elegant stone necklaces are inspired by the lore and symbolism of the Chinese zodiac. I first had the idea after purchasing a jade rat key chain, in honor of my own zodiac sign. 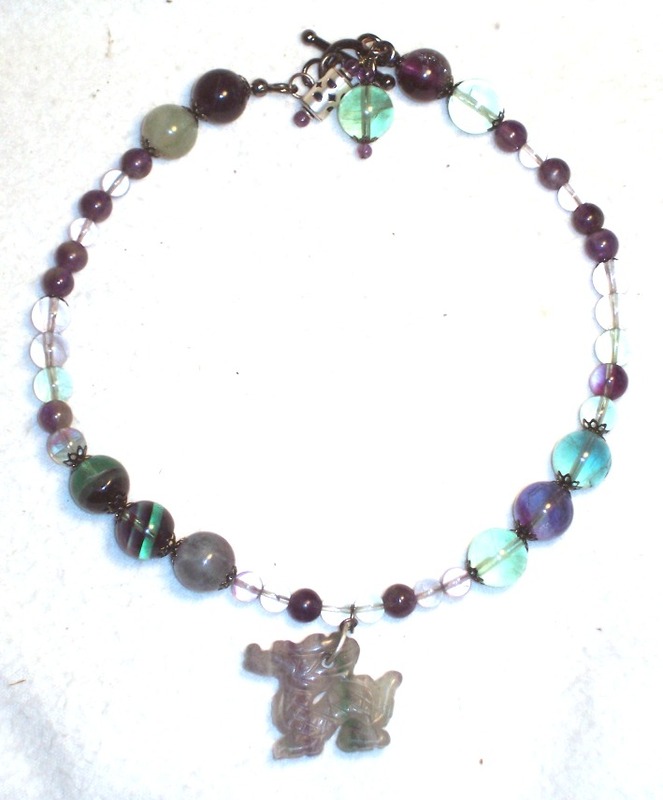 After salvaging a carnelian monkey and purchasing a fluorite dragon, it seemed only natural to begin a series of zodiac jewelry. Each of these necklaces features the same basic design, with “gun metal” filigree end caps, toggles, and genuine sterling silver Bali beads. I am currently on the lookout to complete the set, I need quality stone fetish beads for: ox, boar, horse, snake, rabbit, dog, tiger, rooster & ram. 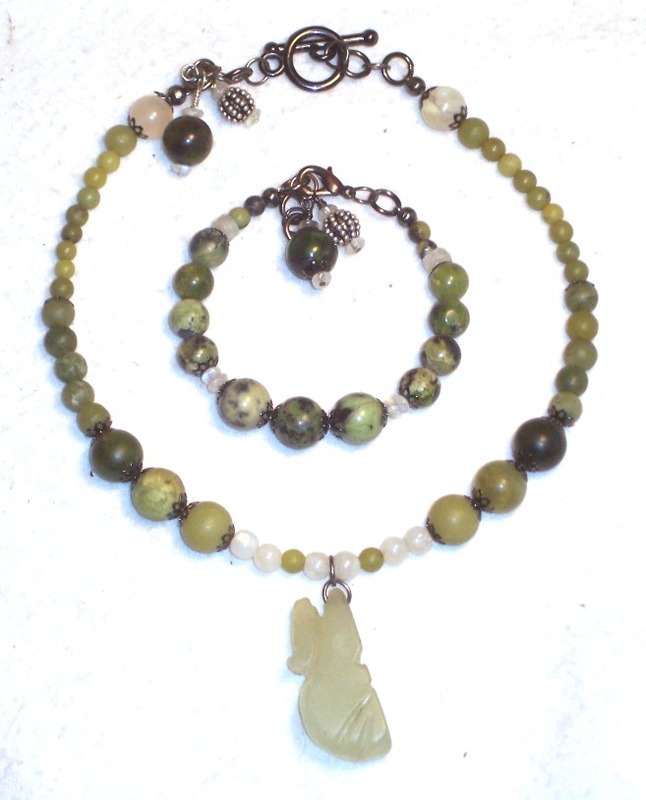 As I previously mentioned, this first necklace (and matching bracelet) features a jade rat focal bead in luxurious pale green. Jade is known as the “dream stone,” and helps to promote harmony. The jade is complemented by rounds of Moonstone, a stone associated with wishes, hopes & femininity. Due to limited Jade supplies, the matching bracelet is actually composed of Green Turquoise, a protective & grounding stone which facillitates mental clarity. 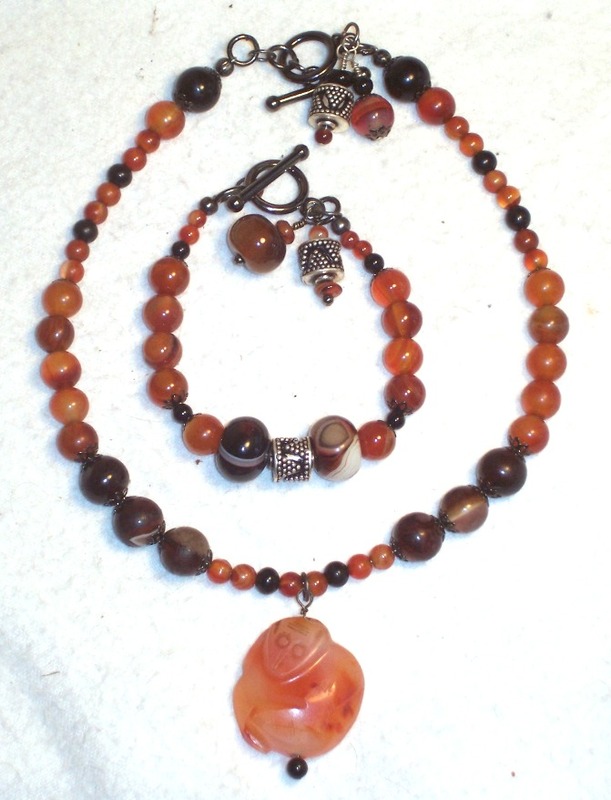 In contrast to the lunar-inspired Rat necklace, this carnelian monkey set is inspired by the warmth of the sun. Carnelian (also known as Sard) is an energetic stone said to enhance happiness & positivity, while sharpening the mind. The small dark rounds which punctuate the set are Onyx, a stone of strength said to banish grief and heighten self-control. The set is tied together by large beautifully banded rounds of Sardonyx, the “lucky stone,” which is actually a naturally formed combination of Onyx and Carnelian. To complete the theme of happiness and celebration, the set is accented by genuine sterling silver Bali drums. This Chinese Zodiac collection is a wonderful combination of beauty and symbolism, which really allows the natural brilliance of the stones to shine as stars. I can’t wait to complete the series, so stay posted for your birth year to be featured as the next Amigami creation. Swallowtail Butterfly Knot Charms Now Available! These butterfly charms have become my instant new favorite, as I’m sure they will be yours. Butterflies are recognized the world over as symbols of joy, life & love. These beautiful butterflies are knotted in the Chinese tradition, with a central Mystic Knot. 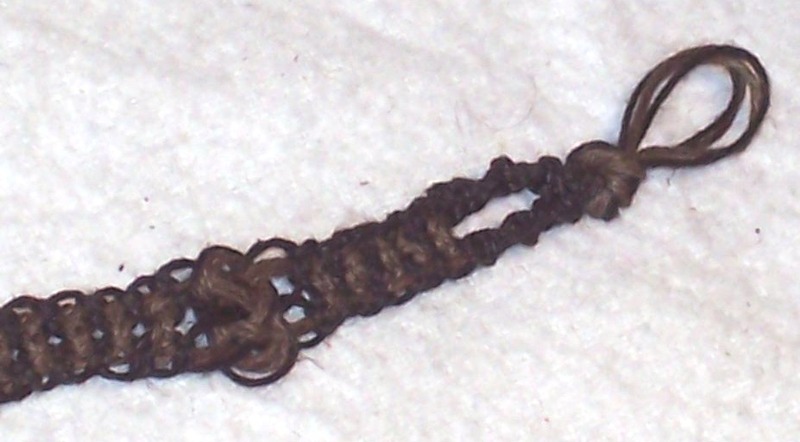 Otherwise known as the Pan Chang, this knot dates back thousands of years in Asian culture, and is considered one of the eight Buddhist treasures. An extremely auspicious symbol, the Mystic Knot is said to bring happiness both to the wearer, as well as all who view it. The wings of the butterfly are interwoven with Josephine Knots (or Carrick Bends), a well-recognized Celtic knot representing true love. The tails of the butterfly feature an additional Josephine Knot, along with Chinese Button Knots and metallic accent beads. Measuring about 3 inches long, and made out of a single strand of 2mm satin cord in a gorgeous redwood brown, this swallowtail charm is the perfect centerpiece for any necklace! And lucky, I just happen to have matching necklaces! Made of high quality complementary satin cord, these clasp-free necklaces are completely adjustable, making them great for all ages. Just pull on the necklace to open (don’t worry, it’s sturdy! ), then pull the central knot apart to re-close. The center of the necklace can be looped through most charms or pendants for an instant new look, making this necklace the ultimate in versatility. Both of these great items are currently for sale in my Etsy shop, and they have already become a high-demand item locally. They’re absolutely gorgeous and ornate, and look fabulous on women of all ages, so make sure to pick one up today! And remember, I can always fulfill custom color requests, just ask! I love showcasing the artwork of others, and even though I’ve already spoke on our visit to Rogers Community Auction, I had to make special note of the wonderful jewelry I acquired there. A mother-daughter team stationed down the market avenue had a fantastic array of beaded stone jewelry. From rings to necklaces, they had four tables featuring a plethora of semi-precious stones and styles. 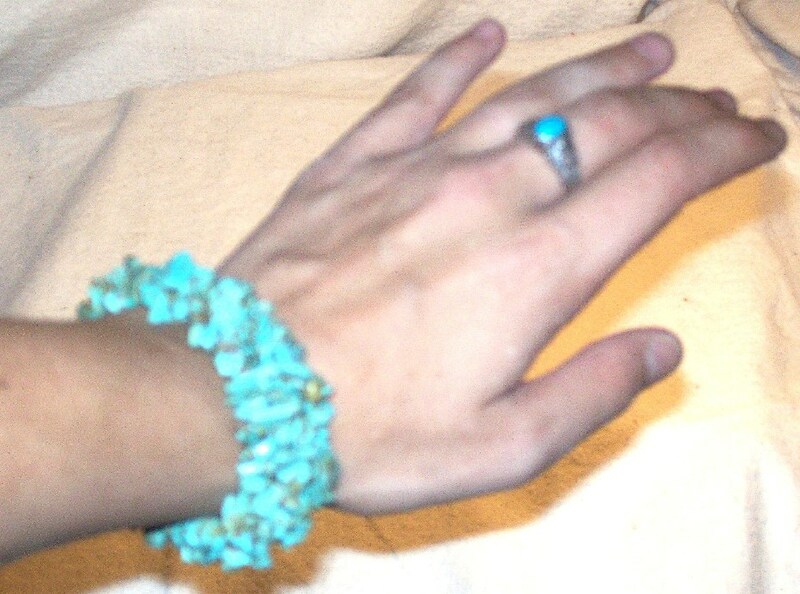 Having what seems to be a genetic predisposition for turquoise, I gravitated towards a perfect-for-summer chunky bangle and matching ring. The bracelet features 5 intersecting bands of pale blue turquoise on elastic (for easy wear & removal). The matching ornate ring showcases a dazzling cabochon set in brilliant sterling silver. Both the mother & daughter were extremely approachable about their products & techniques, and I thank them for the excellent deal they gave me on the set. Ramon went on several hardware outings throughout the day , and returned with a gorgeous pendant for me. 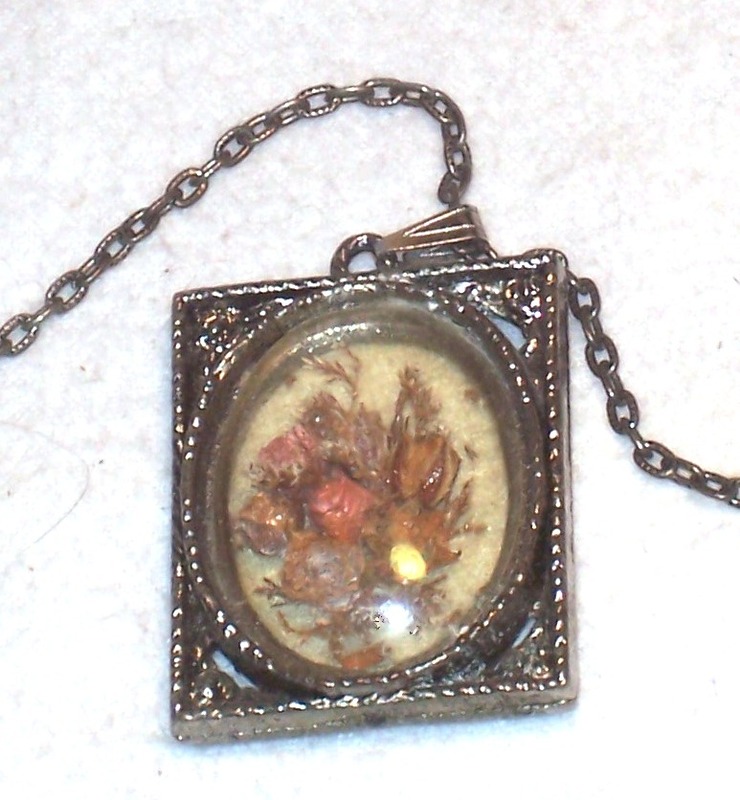 It showcases a perfectly intricate mini dried flower display, in shades of antiqued gold and mauve, encapsulated under a glass dome within a metal frame. 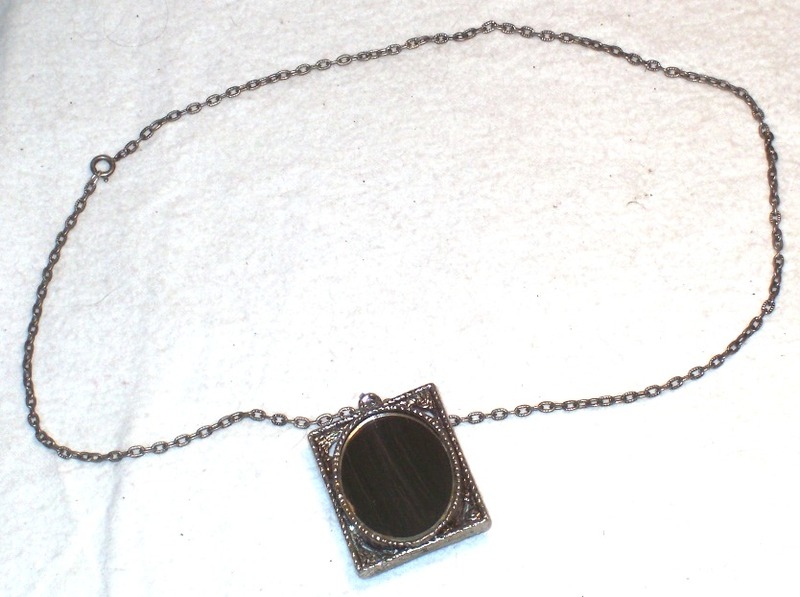 The reverse side holds a mirror of matching proportion, and hangs from a 24″ long complementary chain. I absolutely love this necklace, but there’s one setback: I’m allergic to nickel & most forms of metal. Attempting to coat the chain in clear nail polish would ultimately be fruitless, so unless I find another method of combating my allergy, I may regrettably have to exchange the chain for a hypo-allergenic alternative. If you have any suggestions, please let me know. And finally, our market neighbor Denny, from Cambridge, and his friends had an assortment of goods, including some very special jewelry. We spoke with Denny and his daughter at length, on a multitude of interesting topics – they were both absolute pleasures. He told us about his sister, who was an artist & crafter in her own right, until she unfortunately passed of cancer a few years ago. He had recently rediscovered some of her beaded jewelry, and of course I had to commemorate his sister & our meeting. The medicine pouch I purchased is stunning, with a red & white heart theme, accented by rich gold. Denny also told us of multiple herbal cures of which he is knowledgeable, including the potent Essiac Tea, which aided his sister & countless others through the hardest of times. Denny was SO generous to share this information with us, we feel obligated to use it & pass it on. Thank you Denny & Vanessa, as well as the entire Rogers Market Community, for all your great company & hospitality. As you all know, I am always happy to fulfill custom requests, and this is one I’m exceptionally proud of. My dear friend Autumn showed me this colossal turquoise nugget a few evenings ago, and expressed how much she liked it but was unable to wear it. She had not found any necklace sturdy and aesthetically acceptable enough to showcase such a spectacular specimen. So of course I volunteered my services. Autumn was kind enough to allow me full artistic reign over the project, trusting me to “just make it look nice.” The only stipulations were that it was dark in color and constructed of hemp cord. After contemplating several design ideas, I finally settled on this, which I personally think is an exceptionally elegant concept for women’s jewelry. It is constructed using 8 strands (2 colors with 4 strands each), which are initially split into 2 groups and knotted into double helix spirals using the Half Hitch Knot method. The lacy main body is made using a series of alternating Square Knots, which are punctuated by 3-strand-wide Josephine Knots. 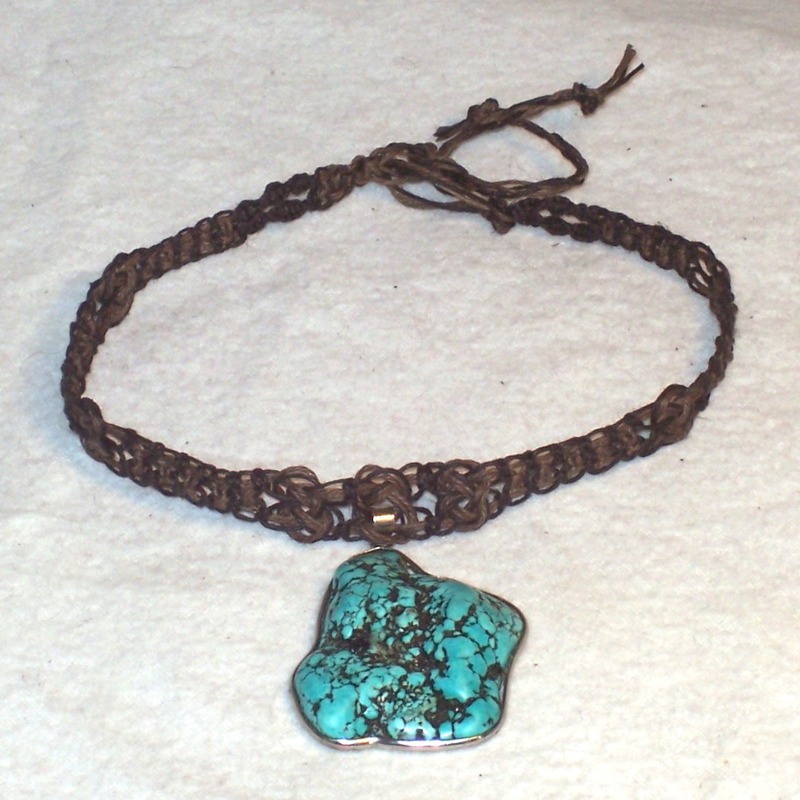 The necklace is woven directly through the bail of the turquoise nugget, and is accented by an additional 3 Josephine Knots. A loop is left on one end and a pair of long 4 strand braids on the other, so the necklace can be tied quickly and simply. Way back when people still bought CDs, I always tried to insist on keeping the booklets. But now that CDs are mostly irrelevant, the actual discs have been passed on, and I found myself with a heap of perfectly square, colorful paper which are perfect for origami. Since this discovery, a few of my friends have donated their kindred heaps . . I intend to make great use of them, and this is the first piece! 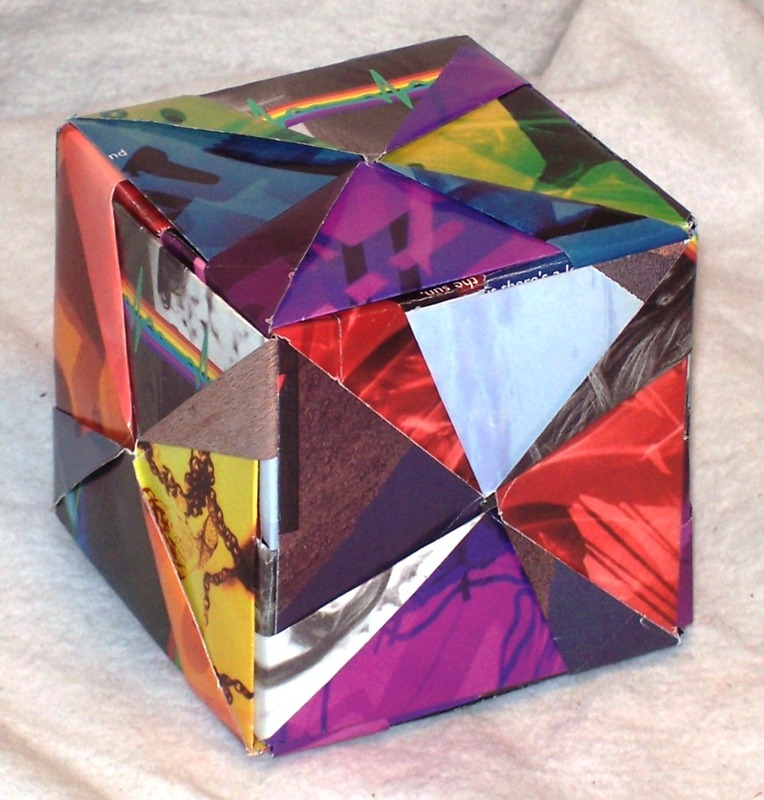 This four inch modular origami cube is dedicated to the laser light shows of classic rock. It is constructed from two complete CD booklets from Pink Floyd’s classic Dark Side of the Moon album. Each square of paper is folded into a basic rectangular shape (with starburst detail), and arranged in an interlocking pattern which is incredibly stable and needs no glue! This is truly an awesome piece of art for any Pink Floyd or classic rock fan, and is currently available on Etsy. Of course, due to limited supplies, this is one-of-a-kind, so first come, first serve! Speaking of which, the Amigami Etsy shop is slowly increasing it’s stock. In addition to the Rock Cubes, I have a tiny sampling of other origami and knot work jewelry, as well as crochet hip bags which are great as phone pr camera cases. Please check them out, and thanks for your support! Colorful Hip Pouches – Great for Phones & Cameras! 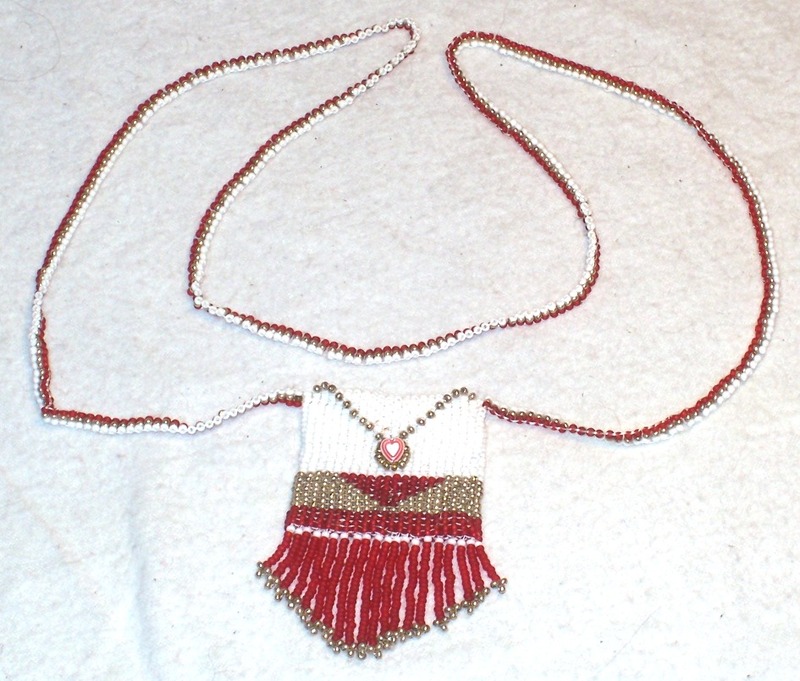 This was my very first attempt at beading my own jewelry in November 2009, and frankly, it’s still one of my favorites. 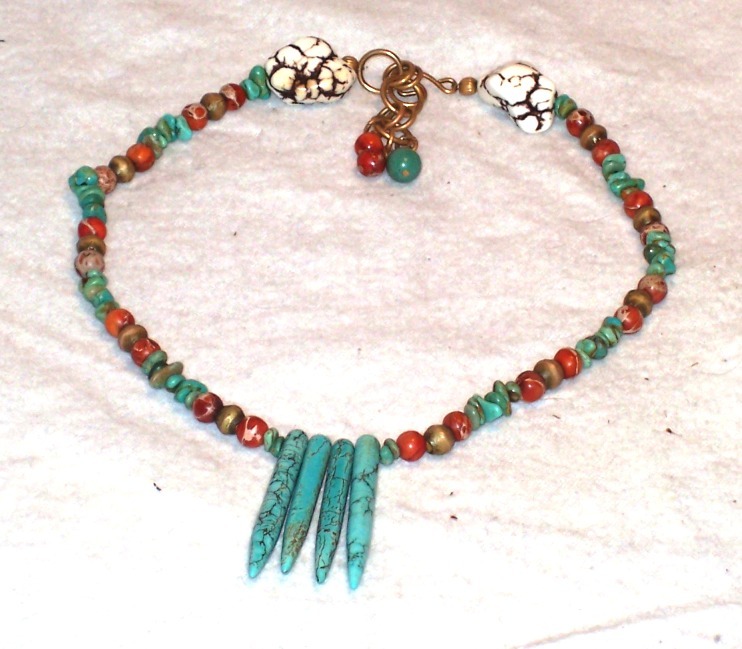 The blue chips and spears, the orange, even the stark white nuggets st the clasp of the necklace, are all variants of the mineral Turquoise. The term itself “turquoise” is a misnomer – it has been inaccurately associated with the rich aqua coloration of the stone, when in reality the mineral turquoise is defined by the rich texture and marbling resulting from the crystallization of copper-rich solutions. 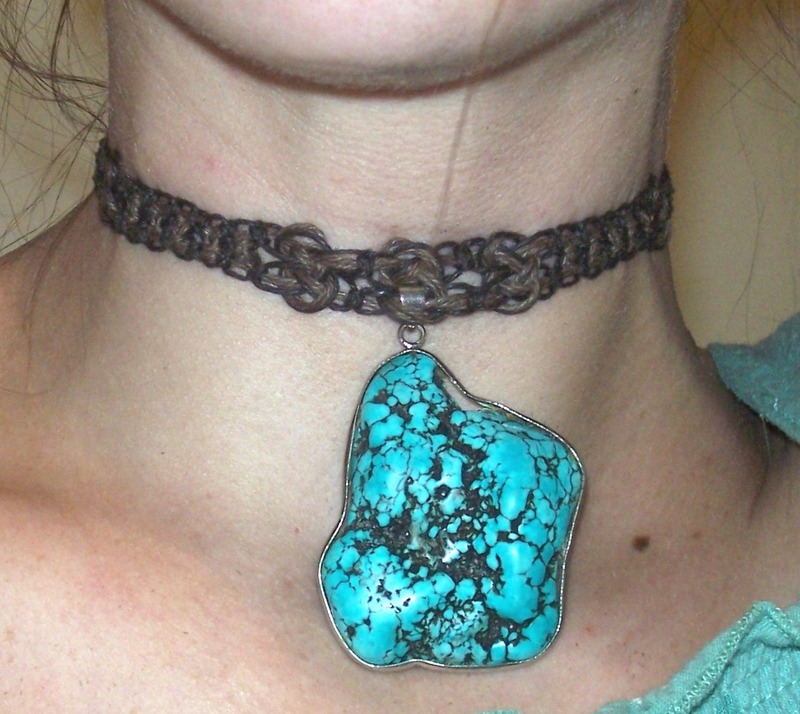 The chips and spears of the necklace were mined from Kingman, Arizona, which is considered to have some of the highest-grade blue turquoise worldwide. Interspersed between are rounds of tribal brass bordered by rare Asian Orange Turquoise, which I find absolutely captivating. Adding flare to the rear of the necklace are two generous nuggets of alabaster turquoise, a spiral toggle and a brass chain clasp accented by blue and orange turquoise rounds. 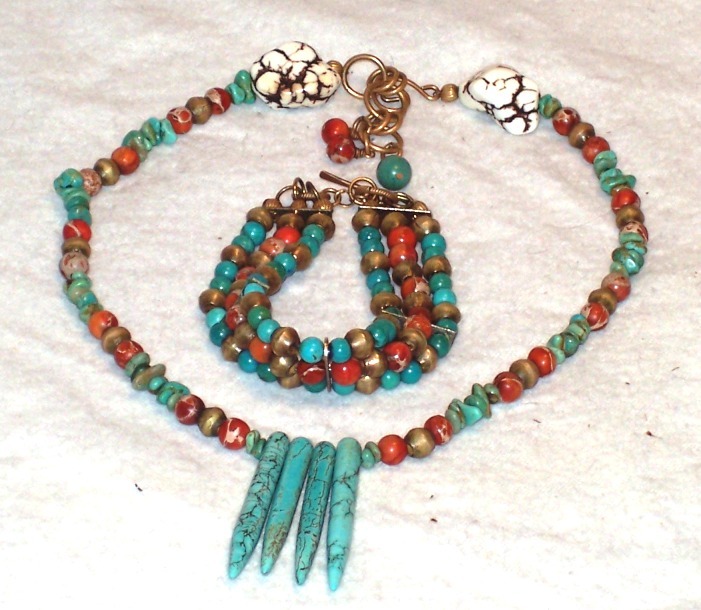 The matching bracelet also features alternating rounds of tribal brass, orange, and blue turquoise, in a slightly off-centered pattern which makes the eye dance. Containing an astounding sixty rounds of turquoise and sectioned by bars made from vintage pot metal, the bracelet has a structure and durability which gives a true feeling of luxury. This matching jewelry set looks magnificent under the summer sun.